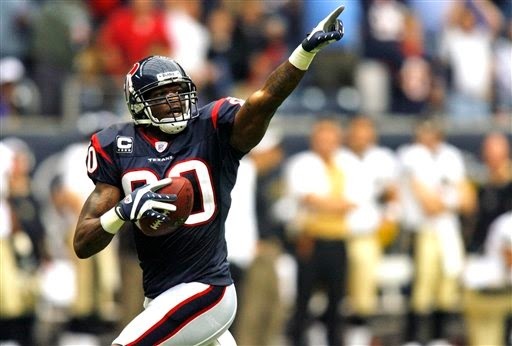 The Texans have released Andre Johnson, ending the star wide receiver's 12-year tenure in Houston. The Texans previously had given Johnson permission to seek a trade, while the seven-time Pro Bowler asked the team to release him. Johnson had two years remaining on his contract and would have counted for $16.1 million against the Texans' salary cap in 2015. Houston saved $8.825 million in cap space by releasing him before June 1. "After exhausting all options of a possible trade, we informed Andre Johnson that he would be released today, Texans general manager Rick Smith said in a statement. "No player in the history of this franchise has represented the team, city and community in a more professional way. Andre is a Hall of Fame caliber player and we appreciate his years of service and contributions to our team." After spending his entire career as a featured receiver in the Texans' offense, Johnson's role on the team was set to change. Rather than accept that, he requested to be traded or released. Before the move Monday, Johnson told ESPN's Josina Anderson that he was "not worried" about being released. "It's just the nature of the business," he told Anderson. "I'm not really worried about it. I will go somewhere else and play, and hopefully I can do well for them." The 2014 season saw Johnson's production dip as second-year receiver DeAndre Hopkinsemerged. Hopkins notched his first 1,000-yard NFL season, while Johnson caught 85 passes for 936 yards. In each of the previous two seasons, Johnson had caught more than 100 passes, for 1,407 and 1,598 yards. "I have so much respect for Andre Johnson and what he's meant to this organization," Texans coach Bill O'Brien said. "Andre carried himself as a true professional and did everything that we asked him to do. Andre will go down as one of the best receivers to every play this game. We are thankful for what he has done for our organization and wish him well on his future playing career." Johnson was the longest-tenured player for the Texans, having been drafted third overall in 2003, the expansion franchise's second draft. Since then, he has become the best offensive player in the history of a franchise that lacked stability at quarterback. In his time with the Texans, he has caught 1,012 passes on 1,599 targets for 13,597 yards. According to the Elias Sports Bureau, Johnson is one of four players in NFL history to play for only one franchise and have 1,000 career receptions. The others are Marvin Harrison (1,102 catches for the Colts), Reggie Wayne (1,070, Colts) and Hines Ward (1,000, Steelers).